Reading, PA (Aug. 28, 2017) — Alvernia University unveiled a newly designed athletics visual identity at a campus-wide event today, to be utilized immediately across all of its 22 sports programs. 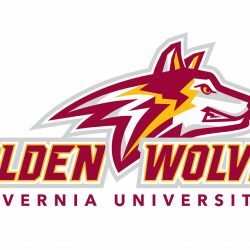 Alvernia’s Golden Wolves logos represent a fierce and new bold approach to its athletics visual identity. The profile version serves as the primary look accompanied with the official word mark. Taking a unique step, the university also has a secondary logo that sports a face-on version. Both versions, which consistently rated high across multiple campus groups, incorporate the university’s traditional maroon and gold colors. According to the iconic Wolf of Gubbio story, St. Francis of Assisi tamed a wolf that had been terrorizing the city in the early 13th Century. The story symbolizes the power of peacemaking. Adding ‘golden’ to the name represents excellence and highlights one of the university’s traditional colors. And, Alvernia’s initials, AU, are the scientific symbol for gold. The school colors, maroon and gold, remain unchanged. Moving forward as the Golden Wolves, the university plans to unveil a new mascot during Homecoming and Family Weekend in October.